Hank Azaria is flying high. The actor opens up about the ebb and flow of a three-decade career in Hollywood, & why his IFC series ‘Brockmire’ is a high point. Plus, the virtuosic mimic showcases his array of voices, from Trump to Pacino to King himself. 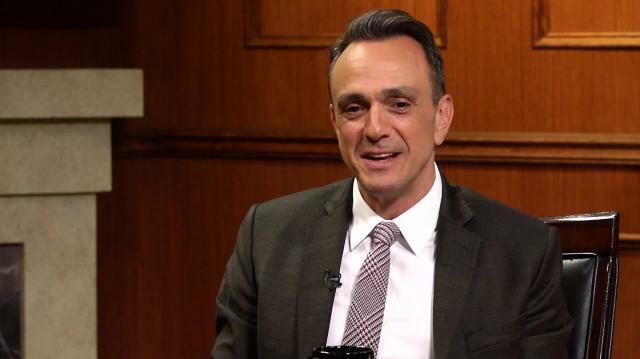 Larry King interviews Hank Azaria, a voice actor with roles on the stage and screen, a director, and a comedian. Azaria has been a Tony nominee and a 6-time Emmy winner. He is known for ‘The Simpsons,’ ‘The Birdcage,’ ‘Mad About You,’ ‘America’s Sweethearts,’ which co-starred King, ‘Huff,’ and ‘The Smurfs’ franchise. Azaria currently stars in the IFC series ‘Brockmire,’ and will star in the upcoming HBO film ‘The Wizard of Lies,’ about the Bernie Madoff scandal. Larry asks Azaria how he came up with the character of Brockmire, whom Azaria describes as having a generic baseball announcer voice inspired by his childhood and love of the Mets. Azaria has had the idea for a long time, and first implemented it in a ‘Funny or Die’ short, then developed it into a show. Larry shows a clip from ‘Brockmire’ and compliments the comedy. Azaria praises the actors, and mentions that first season’s episodes are finished, and that the show has been picked up for a second season. Moving from television to film, Larry asks how Azaria got involved with ‘The Wizard of Lies.’ He was contacted by the director Barry Levinson, and Robert De Niro had already signed on to play Madoff, with Michelle Pfeiffer playing Madoff’s wife. Azaria will play Frank Dipascali, the CFO of Madoff’s company and a perpetrator in the scandal, which King mentions he was a victim of, though he recovered his money. Larry asks if Azaria liked working with De Niro, and Azaria describes it as a thrill and a big deal for an actor. Larry asks what kinds of acting projects Azaria gets. Since he has a versatile reputation as a character actor who can do both comedy and drama, Azaria doesn’t know what projects he’ll get. Currently, Azaria is recording season 29 of ‘The Simpsons,’ a show he has played over 100 roles for over the years. King recalls his own role on ‘The Simpsons,’ and Azaria advises aspiring actors to get a role on a primetime cartoon that lasts 30 years. Azaria himself has lasted 53 years, as the interview day is also his birthday. Larry wishes him happy birthday and mentions it’s also Al Pacino’s birthday. Azaria recounts a time when he worked with Pacino on their birthdays in ‘Heat.’ Larry asks him more about his voiceover work and mimicking, which Azaria considers a vocal trick and which he didn’t know was a special skill at first. Larry asks if there are voices Azaria can’t do, and Azaria says he can’t mimic women and children. Larry asks if he can mimic Trump, and Azaria shows his Trump impression. Azaria reveals he is a Sephardic Jew, which surprises and delights Larry. Larry asks him about other celebrity impressions, and Azaria does impressions of Woody Allen and Al Pacino, mentioning how his Moe the Bartender voice for ‘The Simpsons’ is just a gravelly version of Al Pacino’s voice. Larry asks if Azaria can mimic him, and Azaria does, saying the key to Larry’s voice is just announcing a city and saying hello.